Nemaska Lithium Inc. ("Nemaska Lithium" or the "Corporation") (TSX:NMX)(OTCQX:NMKEF) and Johnson Matthey Plc (LSE:JMAT) (www.matthey.com) announced today that a second shipment of 3.5t of lithium hydroxide has been sent to Johnson Matthey. 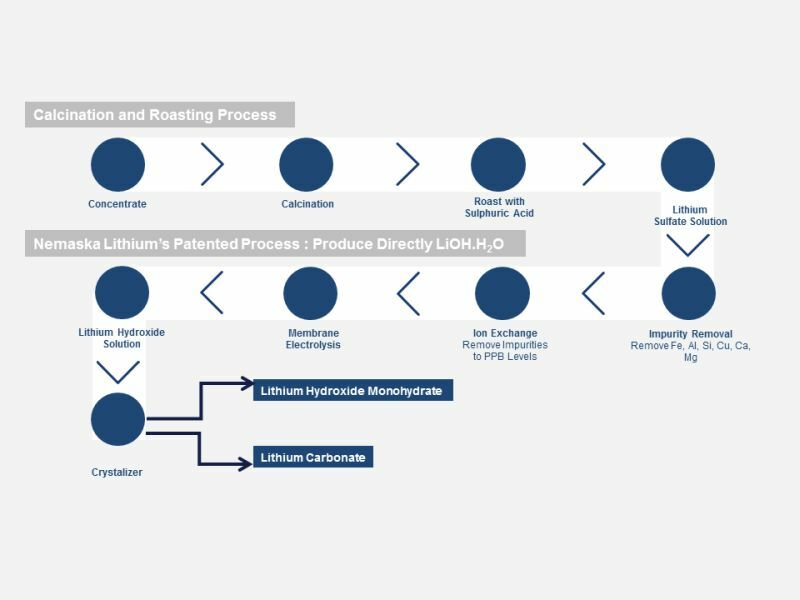 Both Johnson Matthey and Nemaska Lithium confirm that this shipment meets Johnson Matthey's lithium hydroxide specifications. Johnson Matthey is a global speciality chemicals company underpinned by science, technology and its people. A leader in sustainable technologies, many of the group's products enhance the quality of life of millions through their beneficial impact on the environment, human health and wellbeing. The group focuses on clean air, clean energy and low carbon technologies and is an expert in the application and recycling of precious metals. Johnson Matthey has operations in over 30 countries and employs around 13,000 people. Its products and services are sold across the world to a wide range of advanced technology industries. 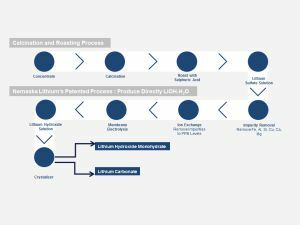 Nemaska Lithium intends to become a lithium hydroxide and lithium carbonate supplier to the emerging lithium battery market that is largely driven by electric vehicles, cell phones, tablets and other consumer products. The Corporation is developing in Quebec one of the most important spodumene lithium hard rock deposit in the world, both in volume and grade. The spodumene concentrate produced at Nemaska Lithium's Whabouchi mine will be shipped to the Corporation's lithium compounds processing plant to be built in Shawinigan, Quebec. This plant will transform spodumene concentrate into high purity lithium hydroxide and carbonate using the proprietary methods developed by the Corporation, and for which the Corporation holds four granted patents and several patent applications that are pending in different countries, covering different aspects and improvements of its proprietary technology for preparing high purity lithium hydroxide and carbonate. All statements, other than statements of historical fact, contained in this press release including, but not limited to, (i) the sending of lithium salts to other customers for evaluation this summer, (ii) the conversion of spodumene concentrate into lithium sulfate and its further processing into lithium hydroxide or lithium carbonate salts, (iii) the installation and commissioning of the calcination system and the acid baking process by the end of June 2017, (iv) the Corporation expecting to produce battery grade lithium hydroxide samples from concentrate by the beginning of July 2017, (v) the sending of lithium hydroxide samples to numerous potential customers globally for evaluation and qualification, (vi) the Phase 1 Plant to be fully commissioned and in production this summer 2017, (vii) all forward-looking statements made in the above-mentioned video (https://vimeo.com/212808490/2d7e938bf8), and (viii) generally, the above "About Nemaska Lithium" paragraph which essentially describe the Corporation's outlook constitute ''forward-looking information'' or ''forward-looking statements'' within the meaning of certain securities laws, and are based on expectations, estimates and projections as of the time of this press release. Forward-looking statements are necessarily based upon a number of estimates and assumptions that, while considered reasonable by the Corporation as of the time of such statements, are inherently subject to significant business, economic and competitive uncertainties and contingencies. These estimates and assumptions may prove to be incorrect. Many of these uncertainties and contingencies can directly or indirectly affect, and could cause, actual results to differ materially from those expressed or implied in any forward-looking statements. There can be no assurance that forward-looking statements will prove to be accurate, as actual results and future events could differ materially from those anticipated in such statements. Forward-looking statements are provided for the purpose of providing information about management's expectations and plans relating to the future. The Corporation disclaims any intention or obligation to update or revise any forward-looking statements or to explain any material difference between subsequent actual events and such forward-looking statements, except to the extent required by applicable law.